With one swing of the bat, Bill Mazeroski won a World Series for the Pittsburgh Pirates and earned a place in baseball history. Eventually making it to Cooperstown through the Veterans Committee, Mazeroski's career was far more than just a single at-bat. This top list will highlight Maz's best cards through his playing days, coaching career, and his enshrinement in the Baseball Hall of Fame. 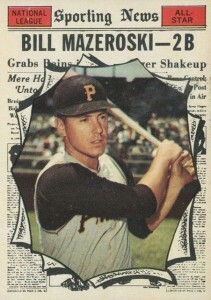 Shop for Bill Mazeroski Cards on eBay. 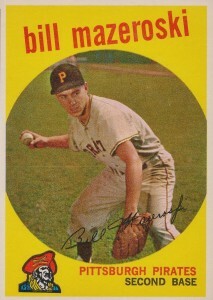 Bill Mazeroski was certainly one of the fan favorites for the Pirates, playing his entire 17-year career with the team. He made the All-Star team in seven seasons and was a part of two World Series winners in 1960 and 1971. Although a single home run turned out to be Mazeroski's lasting legacy, he was a renowned second baseman throughout his career as well. Earning the nickname "The Glove," he was an eight-time Gold Glove winner. 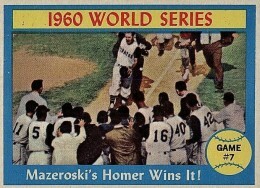 Mazeroski's home run in the bottom of the 9th in Game 7 of the 1960 World Series is often considered the most famous home run ever hit and it is frequently featured in trading card sets today. You can find picturesque cards in 2001 Topps and 2007 Upper Deck Masterpieces featuring him rounding third on his way home to score the winning run. Although Roberto Clemente and Bill Mazeroski never shared a baseball card from their playing days (other than some team photo cards), they were the only two Pirates teammates on both the 1960 and 1971 World Series winning teams. Fans looking for something to celebrate that fact can turn to 2014 Panini Classics, which offers several combination relic cards featuring both players. 2008 Topps Heritage also has Mazeroski relic cards that include a piece of the Pirates' old stadium, Forbes Field. Collectors interested in adding Bill Mazeroski cards to their collections would be right to seek out those honoring his famous home run, but they would also be wise to obtain some of his other memorable cardboard appearances. This top list was constructed with that idea in mind and places card value as a key component in a well-rounded collection. Baseball card sets of the time typically had little variation in design over the entirety of the set. However, collectors must have been surprised by the colorful brilliance of the All-Star selection cards in the last series of the 1959 Topps set. 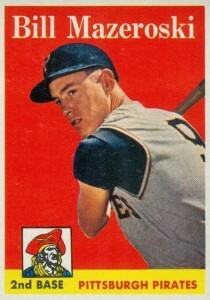 National League players, including Bill Mazeroski, were featured with bright red borders while American League players had blue. This is certainly a budget-friendly option for collectors. 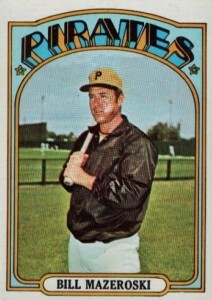 Mazeroski's last card as a player can be found in 1972 Topps, although, he does make appearances in the 1973 and 1974 Topps sets on the Pirates managerial and coaching cards. Transitioning away from the field of play, his excellent defense skills as a player were put to use as a fielding coach. Bill Mazeroski's 1962 Topps card (#353) misses out on having a green-tint variation as those were only in Series 2 (cards #110-196), but he does have a nearly-identical card in the set honoring his All-Star selection. He looks tough as nails on his standard card below but he is smiling brightly on his All-Star card both with the same stance and background. Several cards in the final series of 1967 Topps were actually double printed which is the opposite of what collectors normally faced when trying to complete their collection. 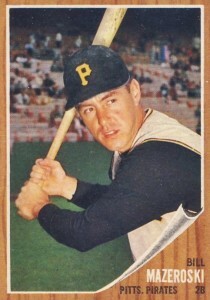 Thankfully, Mazeroski's card avoided that fate and the value has held strong. 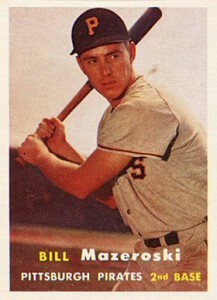 Like his 1959 Topps All-Star card (see #10 on the list), Mazeroski was featured in the 1961 Topps All-Star series that was tacked on to the end of the overall set. Being in the high-series really helps the card's value, making it one of his more valuable options. 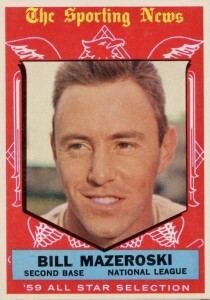 My personal favorite card on the list is Mazeroski's beautifully composed 1959 Topps card. He earned the nickname "The Glove" from his amazing play at second base and Mazeroski looks ready to flick the ball to first to make a play. He still holds the record for most career double plays completed by a second baseman. 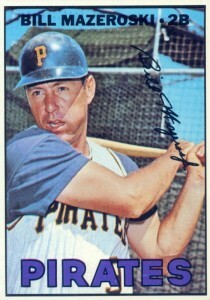 Although images of his famous World Series home run are often included in contemporary sets, certified autograph cards for Bill Mazeroski are not quite as common. Several sets from the early 2000s by both Upper Deck and Topps feature Maz's autographs but he hasn't been a frequent signer in several years. The actual baseball Mazeroski hit over the wall to win the World Series has been lost to history and so it would seem appropriate to grab a baseball-themed autograph like the ones featured in several Upper Deck Sweet Spot sets. Mazeroski's second-year card in 1958 Topps checks in at about half the value of his 1957 rookie and so budget-minded collectors looking for an early Bill Mazeroski card may want to track this card down first. Bill Mazeroski is featured on five different cards in the 1961 Topps set, with this card celebrating Game 7 of the World Series certainly being the most memorable. Although he was not known as a power hitter (his season-high home run total was 19), he still stands alone as the only person with a walk-off home run in a World Series Game 7. The reverse side of the 1957 Topps cards featured full career stats for the first time and this key Bill Mazeroski card reminds us that he was signed by the Pirates at the young age of 17. 1957 Topps is also remembered for its many memorable rookie cards and Mazeroski's is in the middle tier, reaching about $200 for high-graded versions. 1967 Topps Bill Mazeroski – #510 PSA 8.5! Pirates!